2) Overall, the user’s satisfaction of searching garage system by specifying the location on a map and notification the broken car was at the high level (X=3.77, S.D.=0.59) and when considered each aspect, the most satisfaction is utilization of system was at high level (X=3.88, S.D.=0.61). 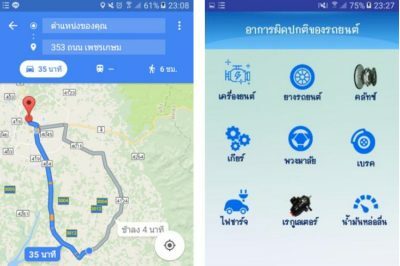 3) Overall, the performance evaluation of searching garage system by specifying the location on a map and notification the broken car: case study Trang province was at the very high level. (X =4.34,S.D.=0.53) and when considered each aspect, the highest performance evaluation is utilization of system was at very high level (X =4.34, S.D.=0.53).